It’s soup season! 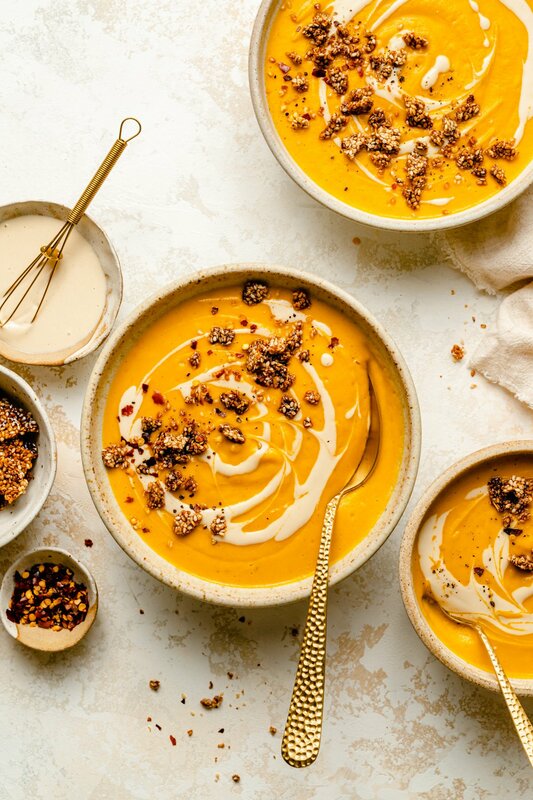 More specifically, Sweet Potato Tahini Soup season. I’m totally fascinated by Thanksgiving. Obviously, being a Brit, it’s not something I have ever celebrated (yet! ), but from what I’ve seen here on the internet, it looks awesome! I love that you get not one, but two epic feasts to enjoy during the winter season. And sweet potato casserole? That kinda just blows my mind. A side dish topped with marshmallows?! I guess it’s one of those ‘don’t knock it until you’ve tried it’ dishes? But what really gets me? THE PIES. Oh my goodness. So many pies. Pecan, pumpkin, sweet potato, apple…and my personal favourite that I’ve seen lately, chocolate chip cookie. I seriously need that pie in my life! In fact, I really need to make some more pies. I make plenty of savoury ones, especially at this time of year when we’re constantly craving serious comfort food in this house. But I really need to get my sweet pie act together! Any suggestions for the best autumnal sweet pie fillings? I feel a need to have a play with some pastry dough. Although I’ve just realised that I don’t actually own a proper pie dish! A round one, I mean. Gosh, that might have to be rectified. Anyway, let me know pie filling suggestions in the comments! 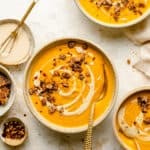 Even though I won’t be celebrating Thanksgiving a week today, I’ll certainly be getting my fill of sweet potatoes in the form of Sweet Potato Tahini Soup! Ah, this soup. It’s simple but truly delicious. I’ve mentioned before that I used to have a hard time eating foods that were both savoury AND sweet. I’m largely over this now and have grown to appreciate how incredible that combination can be (case in point). There are still exceptions though, one of them being winter squash. I know everybody raves about them at this time of year and I really want to love them, especially as they’re so pretty but I just don’t! The day that you see a savoury squash recipe (or let’s face it, any squash recipe) here on the blog will be a monumental day. I hope that day comes because it’s basically the only vegetable that I don’t love (ok, turnips may be the only other, though I do need to give them another chance!). Anyway, my point is that despite its inherent sweetness, I find sweet potato to be one of the most delicious vegetables ever! It’s sweetness is somehow naturally perfectly balanced and I love it. I wanted to enrich this soup with tahini because I envisaged that the subtle bitterness of tahini would play off the, er, sweetness of the sweet potato and be incredibly delicious. I WAS NOT WRONG. The base of the soup is a gently spiced mix of onions and carrots and it’s finished off with just a squeeze of lime juice to lift all of the flavours. On top is a simple tahini swirl because there is no such thing as too much tahini. And then there’s a final flourish in the form of a quick sesame brittle. You don’t have to make this but it adds a different textural dimension and enhances the flavour of the tahini in the soup – plus it’s super simple so why not? 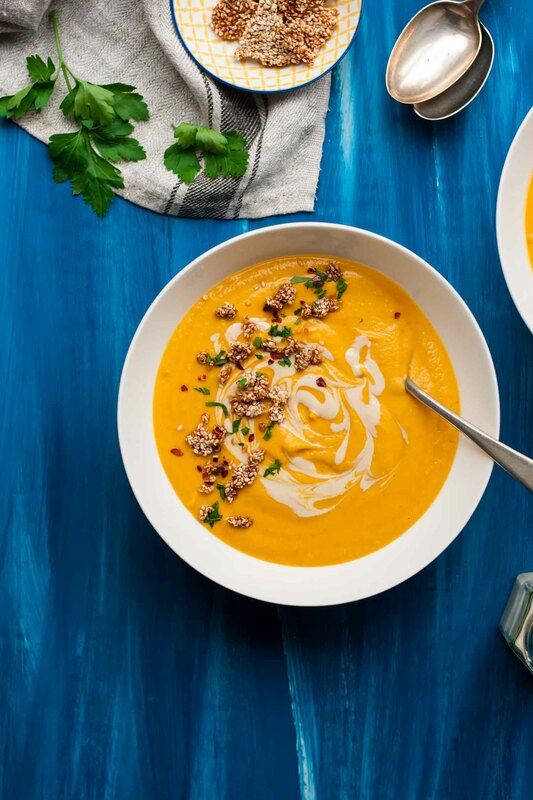 This Sweet Potato Tahini Soup is silky and warming and just everything you could possibly need on a cold and blustery day. And a wonderful addition to your Thanksgiving table, perhaps? Oh and this soup is naturally vegan and gluten free so it’s perfect for entertaining those guests who might have special dietary needs – win! Heat 1 tablespoon oil in a large pan. Add the onion, carrots and a pinch of salt and cook for 5 minutes until soft. Add the spices and cook for another 2-3 minutes. Add the sweet potato and stir to coat in the spices. Add the vegetable stock and bring to the boil. Reduce the heat, place the lid on the pan and simmer for 15-20 minutes or until the sweet potato is tender. Add the tahini and lime juice and blend until smooth, adding up to another 1/2 cup of water or stock if needed to achieve the consistency you like. Season to taste. Serve topped with sesame brittle and tahini drizzle. Sprinkle with a pinch of chilli flakes and some finely chopped parsley, if liked. Mix together all ingredients in a small bowl. Spread out on a baking sheet lined with a non-stick baking sheet or parchment paper and bake for 20 minutes until lightly golden. Leave to cool and then break into shards to serve. Put all ingredients into a small bowl and whisk to combine. This recipe makes enough for 2 large or 3 smaller bowls of soup. Easily doubled to serve 4-6.
love how sunny and creamy this looks! Thanks Heather! The colour is really cheering isn’t it? 🙂 and whoa! I’ve seen that on How I Met Your Mother but I thought it was made up haha! So it’s a real thing?! It doesn’t have potato chips and gummy bears though, right? Lol! i don’t remember seeing it on how i met your mother but i guess that just means it’s time to re-watch!!! (: the kind that i’ve had doesn’t, though i guess the potato chips would add some crunch and the gummy bears would add some chew (i think i’ll just stick to the usual!). Love this recipe! Hey Sasha! Came across your blog today, and what a treat that is! Beautiful photos and stunning recipes! Soup is my comfort food, and can’t imagine going through the day (at this time of the year) without it! 🙂 Will definitely be trying this one out! Pinning for sure! Just made this!! Added cardamom and cinnamon to give it a little more of an Indian flavor and only blended half the veggies so it wasn’t creamy and chunky. SO good!!!! Thanks for the recipe! SO glad you enjoyed it Zoe! Thanks for letting me know! Your tweaks sound delicious!! Soup is lovely but as soon as I added the lime juice to the tahini for the drizzle it just chunked up. It’s like a batter consistency. Any ideas?